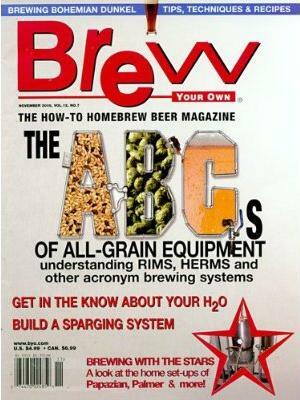 Brew Your Own Magazine , published for homebrewers of all levels, is the most popular "how-to homebrew beer magazine". Brew Your Own magazine provides fun practical hands on tips, recipes and techniques to brew great tasting beer for hobbyists who make their own beer. Brew Your Own Beer magazine consists of stories, tips, projects and great recipes and information on equipment needed. In each issue of Brew Your Own magazine readers will find feature stories about homebrewers, as well as a Mr. Wizard section to answer any readers questions.